Are you ready for some football?! Sonoma County Winegrowers, Sonoma County Tourism, and Sonoma County Vintners have teamed up to be an official destination partner of the Super Bowl 50 Host Committee. As a destination sponsor, Sonoma County wines were poured at VIP receptions, NFL owners meetings, as well as media and major sponsor events. 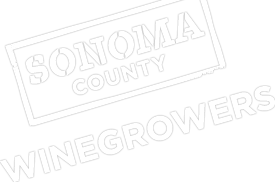 Sonoma County was also the only regional sponsor allowed to pour wines inside the event’s “Super Bowl City” fan experience, that drew over a million people. During this special segment of Off the Vine, The Drive with Steve Jaxon joined Karissa and Sonoma County Winegrowers in the heart of Super Bowl Citya the Sonoma County Wine Lounge for a live broadcast! Listen and learn who dropped by the broadcast and football stars with wine ties.